The creation of a template or a document are similar. 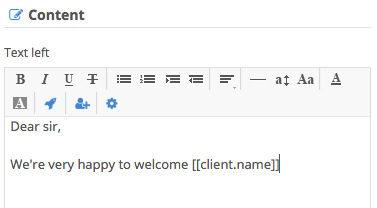 The only difference are the settings: for a template you choose the connection types (customer, sales document...), but if you create a document directly you choose the link itself (the client for example). To create a template, click New redactor template from the Redactor menu. 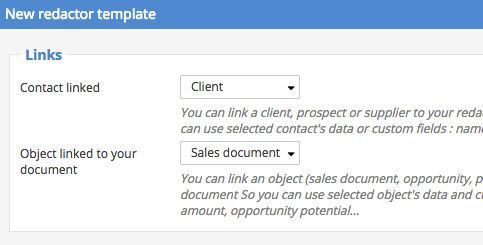 This is the type of contact that you can link to the document (client, prospect or supplier). Once your setup made, click Continue. 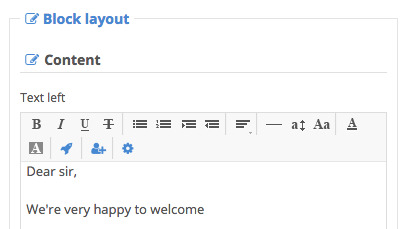 You land in the template design builder. On the right you'll find the items that you can drag into your template. These elements are detailed further in the FAQ, along with the page numbering and layout options. 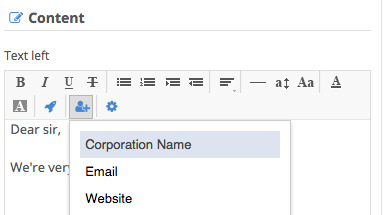 Save your document, your document is generated in PDF for control and ready for use via the New Document command.